Ukrainian MP Nadia Savchenko has been freed on conditions, which she put forward herself, she didn't ask for pardon, hasn't acknowledged her guilt, her defense lawyer Mykola Polozov has said. 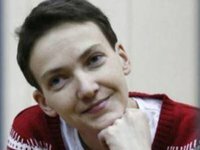 "Nadia Savchenko is free on conditions that she put forward herself. She did not ask for clemency, did not admit her guilt," he said at a press conference in Kyiv on Thursday.